I've discovered that there's nothing quite like a couple of 52 gallon plastic storage tubs full of old school papers (and Styrofoam balls and wire rings that have been transformed into protons and neutrons) to take me on a not completely pleasant trip down School Project Memory Lane. 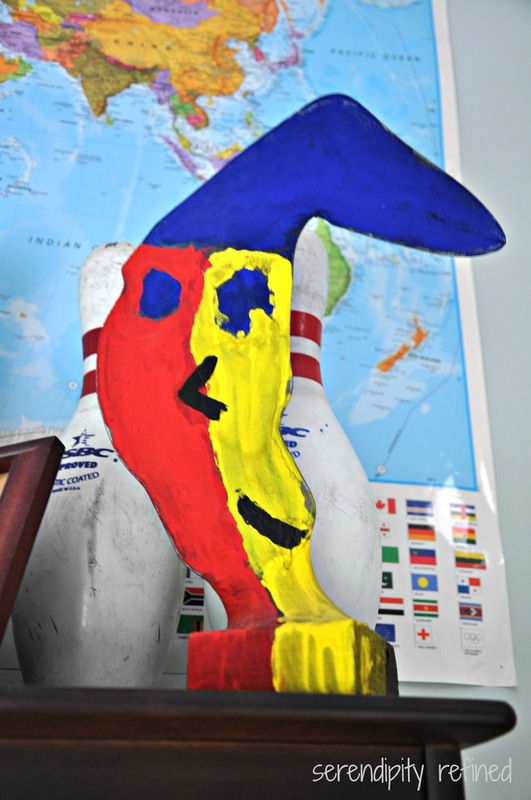 I know that you're probably going to be shocked to find out that it's not the primary colored jester made from a block of wood, a wire hanger and an old nylon stocking painted with Tempera paint. ...You probably thought that's what I was going to say, didn't you?! Nope...it's not him...but he does make me smile. My favorite project from my sons' school careers is the family heritage project from spring semester of third grade. The assignment: Create a four generation family tree. Parents were encouraged to assist with this project and the format was wide open. You've already seen my youngest son's project in our Formal Living Room Reveal post from Monday. 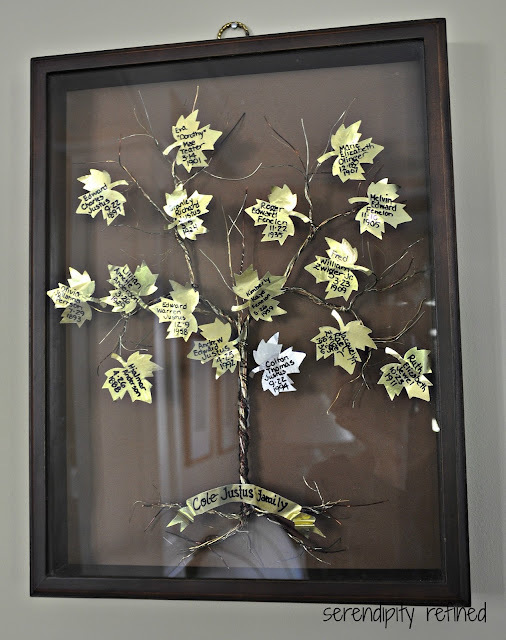 A couple of you wrote to ask for the details of how it was made and today, I'm sharing the details about how we made both of the family trees that hang in our home. That's correct...two of them...one for each of my sons. Of course, since we made these over ten years ago, there are no step by step tutorials , but I'll do the best that I can to explain how they were created. First, the easier of the two projects. This is the family tree of my oldest. Unframed, it measures approximately 11 by 14 inches. 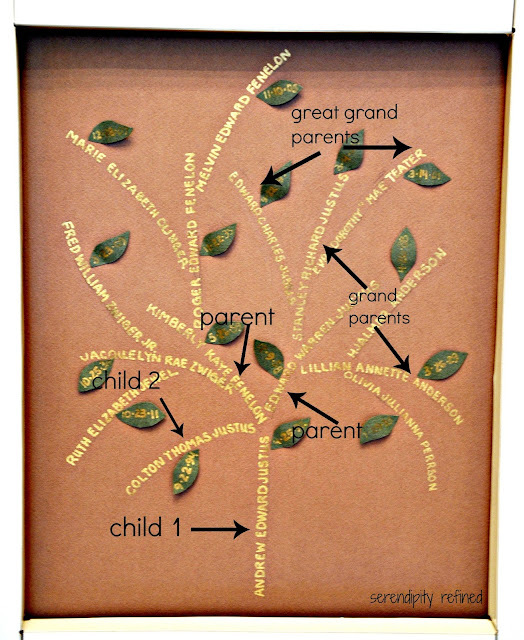 To make this version of our family tree, we cut a piece of dark brown artist's charcoal paper (scrap book paper or poster board would also work) to the desired size. In pencil, I drew a very light outline of the tree, beginning with a trunk and two branches. My oldest son's name forms the "trunk" of the tree, the first two branches are my husband and me. I tucked in a small branch for my youngest son above the trunk at the point where the first two branches meet. After I sketched the first two branches, I simply made two branches coming off of each of the preceding branches (one for each parent, grand parent, and great grand parent). 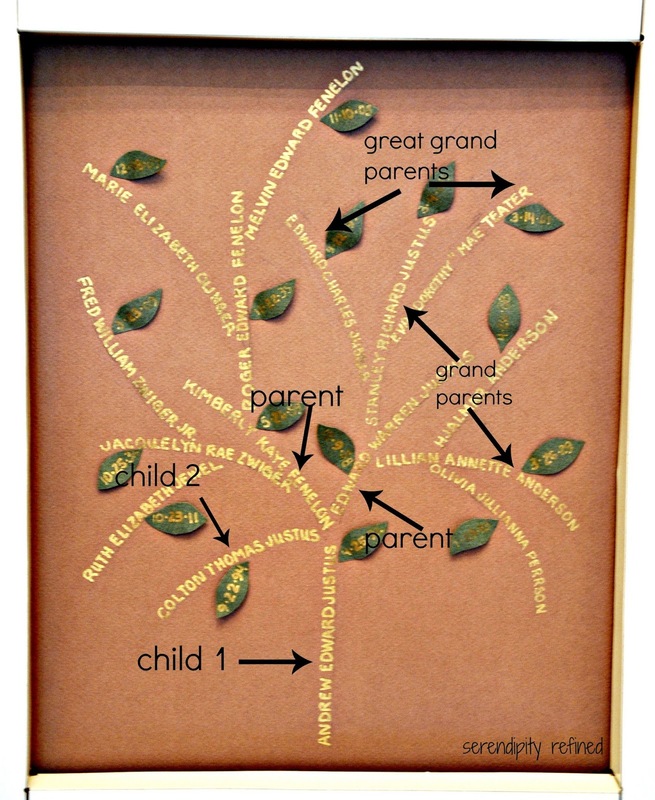 We've got a pretty simple family tree but this design could easily be modified to include other family members. Once the branches were drawn, I used gold paint marker to print the names of each family member. Then, my son cut green "leaves" onto which I printed the month, day and year of each person's birth and glued them to a spot along that person's "branch". 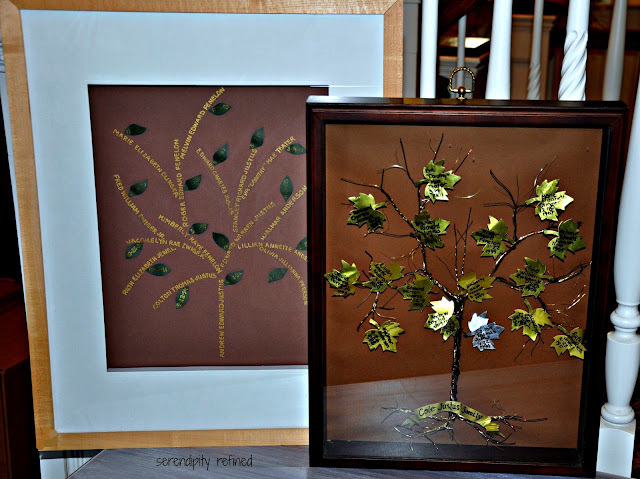 The finished tree is framed in a shadow box frame that I purchased at the craft store. This allows the leaves not to lie flat against the background and to give the tree a three dimensional quality. 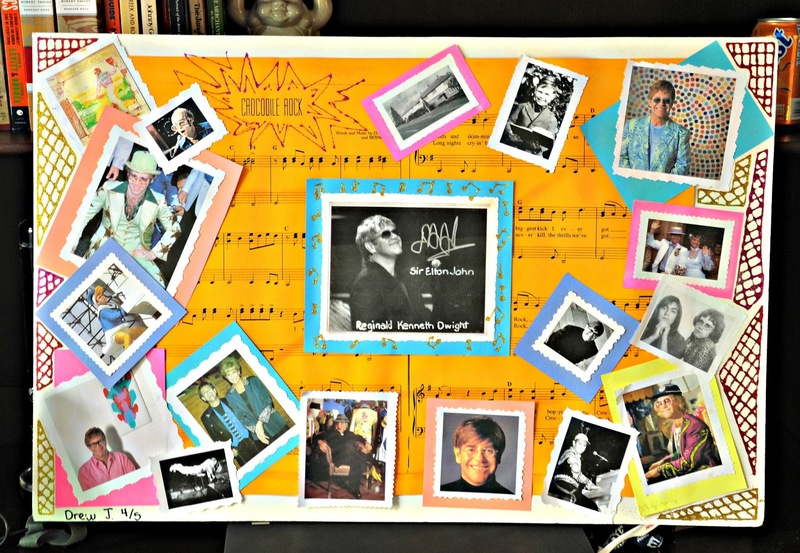 Three years later, when my youngest did this project, he had other ideas. He likes to build things. His family tree is constructed from many different sizes and thicknesses of wire and some punched metal leaves. Silver, copper, black and brass wire of varying gauges were twisted together to form the trunk, roots and branches onto which we glued the metal leaves. This tree is basically a free form wire sculpture. We started with a thick bundle of wires that were about two feet long. Starting about 3 inches from the bottom, we twisted them and wrapped another piece of wire around them to form the trunk. Then, we divided the bundle in half and formed two branches, twisted a bit more, divided that half bundle into two more "branches" and so on. At the ends of the branches, I fanned out the remaining wire to form a "canopy". At the base of the tree, the ends of the wires formed the "roots". 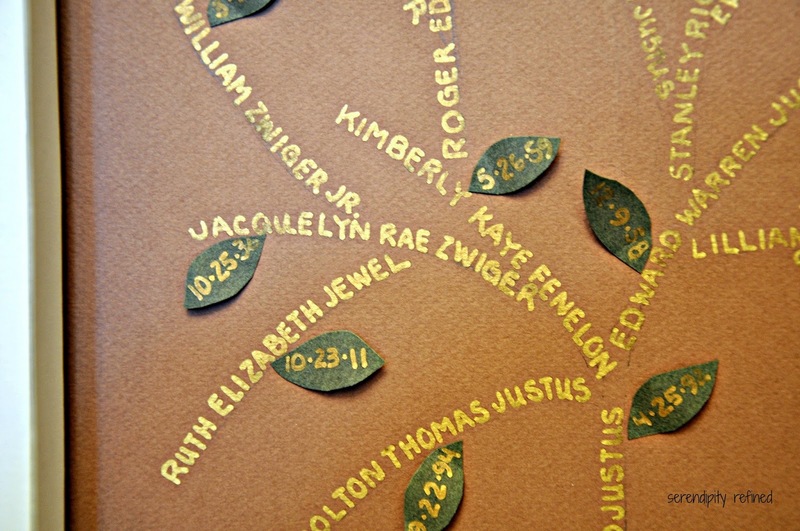 The tree was hot glued onto a piece of mat board which was covered in brown paper. Using a two inch, leaf shaped craft punch, we punched the leaves from brass foil (slightly thicker than aluminum foil and brass colored on one side) which we found at the craft store. 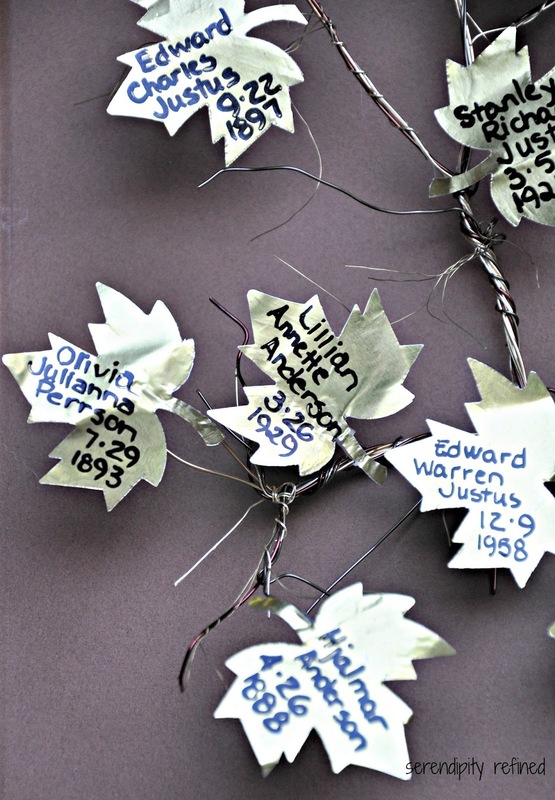 Since there wasn't an easy way to print names on the wires, the leaves contain both the names and the birth dates of our family members. 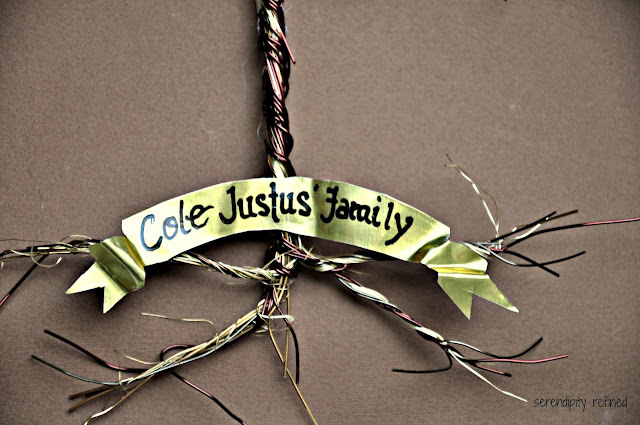 I printed them onto the leaves in black paint marker and we hot glued them to the branches. We also made a banner for the base of the tree, just above the roots, designating it as belonging to my son (just in case his name on the only silver leaf wasn't enough). This tree is also framed in a shadow box frame from the craft store because the tree is also three dimensional. Here they are, side by side: two family trees containing the very same relatives that are as different as the "night and day" boys men to whom they belong. 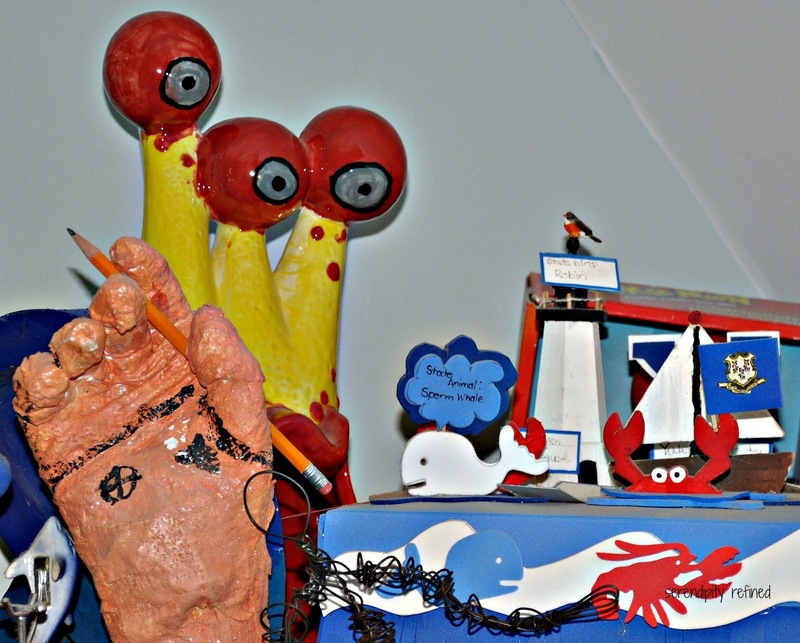 ...instead of heading to the recycling bin for Monday morning trash pick up with the atom project and the Connecticut state float. Don't worry, the "jester guy" made it through this round of purging and is safely packed away with the other treasures but we're still on the fence about Elton John. 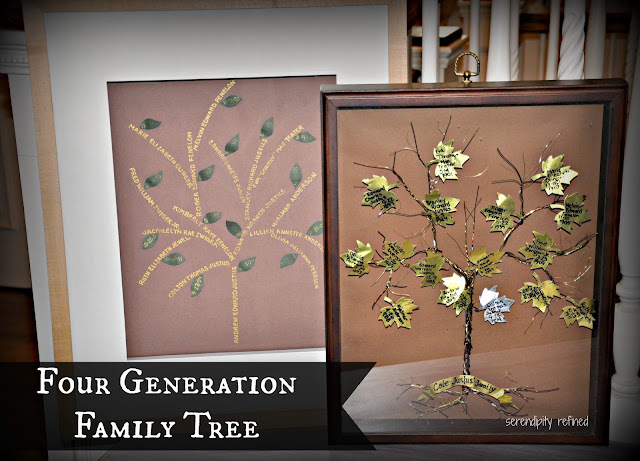 I hope that this inspires you to create your own family tree and as always, I'd love to see it if you do! Roots to know where home is, wings to fly away and exercise what's been taught them.